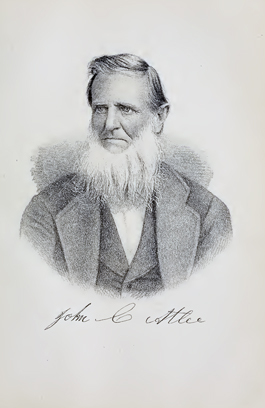 John C. Atlee, of Fort Madison, now deceased, who as a pioneer in the development of the lumber industry of southeastern Iowa and an active promoter of railroad construction contributed in a large measure to the substantial upbuilding and progress of the state, his labors entitling him to classification with its founders and builders, was descended from English ancestry. A native of Maryland, he was born on the 22d of March, 1816, and spent his youth in that state, living with his paternal grandparents. Subsequently he removed to New York city, where he entered upon an apprenticeship to the carpenter’s trade and when his term of indenture had ended he was employed as a journeyman in New York city for several years. The keen foresight which enabled him in later years to recognize and improve business opportunities led him to seek a home in the West and he went by way of the sea to New Orleans and thence to Mobile, Alabama, working in different cities at his trade. His sojourn in the South, however, was temporary and he made his way up the Mississippi river to Fort Madison, where he arrived in 1836, finding an embryo town with the development and upbuilding, with which he became closely associated. He continued his active connection with building operations until 1841, assisting in the construction of many of the more important of the early buildings of Fort Madison. In the year mentioned, however, he removed to Cedar township, where he purchased a tract of land and developed a farm, but after carrying on agricultural pursuits for eleven years he returned to Fort Madison in 1852 and began the lumber business. He dealt in the manufactured product until 1855, when in connection with a Mr. Bennett, under the firm name of Atlee & Bennett, he built a sawmill, which they operated for two years. On the expiration of that period he purchased his partner’s interest, thus becoming sole proprietor. The mill was located on the present site of the extensive Atlee lumber enterprise of Fort Madison that is now conducted by his son, Samuel Atlee. The father enlarged the mill from time to time as the demand for his product increased and became the owner of the first extensive lumber industry of the city. He was also the first man to bring logs down the river to be manufactured into a marketable commodity and he caraefully watched for indications pointing to success, enlarging and developing his business as he saw opportunity until its importance as a productive industry of southeastern Iowa was widely acknowledged. About 1868 he admitted his son Samuel to a partnership and the fire style of S. & J. C. Atlee was assumed. The relation between father and son was maintained for some time, but ultimately the father retired from active business life some years prior to his death. Had he confined his attention alone to his lumber business he would have merited distinction as a citizen of southeastern Iowa who had won notable success, and yet he extended his efforts into other fields of activity that resulted to the great benefit of the state as well as to his individual prosperity. He was instrumental in securing the building of the St. Louis, Keokuk & Northwestern Railroad, now a part of the Chicago, Burlington & Quincy system through Fort Madison. He was likewise instrumental in the building of the Chicago, Burlington & Kansas City road and with B. W. Davis took the contract for building the section of the road from Fort Madison to Farmington. It was also largely through his influence that the narrow gauge road to West Point, now a branch of the Chicago, Burlington & Quincy Railroad, was constructed and his labors proved a potent factor in securing the extension of the Santa Fe Railroad to Fort Madison. No other element has done more to advance civilization and promote industrial and commercial activity than has railroad building and in this connection Mr. Atlee’s service proved of direct and lasting benefit to his adopted state. A stanch advocate of Republican principles from the organization of the party to the time of his demise John C. Atlee, although without aspirations for public office, represented his ward in the city council and was also a member of the school board. He was especially interested in educational matters and township improvements and was a co-operant factor in many measures that resulted beneficially to Fort Madison and Lee county. Fraternally he was connected with the Independent Order of Odd Fellows, his association therewith dating back to the middle of the nineteenth century. Mr. Atlee was married at Quincy, Illinois, in 1836, to Miss Emeline S. Brooks, of Boston, Massachusetts, a representative of the same family to which Philips Brooks, the noted divine, belonged. Mr. and Mrs. Atlee became the parents of four children who reached adult age: Samuel, Martha, the wife of Peter Okell, of Fort Madison; Margaret, the wife of G. M. Hanchett, and William H.
The life record of John C. Atlee forms no unimportant chapter in the history of Lee county, for along business, social, political, educational and moral lines his influence was felt as a directing force and his labors were of acknowledged benefit.